First day down, 9 hours in the same room with 4 presenters wasn’t bad, but I was at least expecting some hands-on time with the software. No such luck, we were subjected to “death by PowerPoint”. I now have a much better understanding of the parts and pieces of our creaky CallManager system, but the new one won’t be Call Manager, Cisco has changed the name to “CUCM”, “Cisco Unified Communications Manager” I think. Dial plans, calling search spaces, route points, SIP, SCCP, CTI, my head is spinning in the acronym soup. Keynote from the CEO in 45 minutes or so. I’m off to Anaheim next week for the Networkers at Cisco Live. If you are in the WILL viewing area, watch Prairie Fire and like it, you should take a look through the archives available on the recently new site. Lots of people over at WILL did quite a bit of work to get that videotape into electronic format. 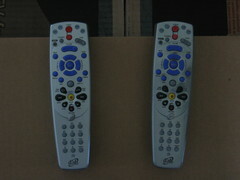 Update (7/6/07): Can you tell which remote is the old one?